How to implement a GraphQL API that queries Neo4j for a simple movie app. If you're interested in making the move from REST to GraphQL, check out this OSCON video from the team at Github. GraphQL is a powerful new tool for building APIs that allows clients to ask for only the data they need. Originally designed at Facebook to minimize data sent over the wire and reduce round-trip API requests for rendering views in native mobile apps, GraphQL has since been open sourced to a healthy community that is building developer tools. There are also a number of large companies and startups such as GitHub, Yelp, Coursera, Shopify, and Mattermark building public and internal GraphQL APIs. GraphQL by design can work with any database or backend system, however in this example we'll be using the Neo4j graph database as our persistence layer. Why use a graph database with GraphQL? The idea of application data as a graph is an underpinning design choice of GraphQL. For example, think of customers who have placed orders that contain products—that's a graph! GraphQL enables developers to translate their backend data into the application data graph on the frontend, but if we use a graph database on the backend we can do away with this impedance mismatch and we have graphs all the way down. Search for movies by specifying a substring to be matched against movie titles. For each movie, show "recommended" or similar movies. In a traditional REST-ish API approach we might create two separate endpoints, perhaps /movies/search and /movies/similar. One endpoint to search for movies by substring of the title, and another to return a list of similar movies. As we add additional features we might keep adding endpoints. With GraphQL, our API is served from a single endpoint /graphql that takes one or more GraphQL queries and returns JSON data in a shape that is specified by the GraphQL query - only the data requested by the client is returned. Let's see how we can build this simple API. First of all we’ll need a Neo4j database (with data) for our GraphQL server to query. For this example we’ll make use of a Neo4j Sandbox instance. Neo4j Sandbox allows us to quickly spin up a hosted Neo4j instance, optionally with existing datasets focused around specific use cases. We’ll use the Recommendations Neo4j Sandbox which includes data about movies and movie reviews and is designed to be used for generating personalized recommendations (for example, by using collaborative filtering to recommend movies based on similar users’ reviews). We’ll follow the “GraphQL First” development paradigm. In this approach, we start by defining a GraphQL schema. This schema defines the types and queries available in our API and then becomes the specification for the API. If we were building a complete application, the frontend developers could use this schema to build out the frontend while the backend team builds the backend in parallel, speeding development. Once we’ve defined our schema we’ll need to create resolver functions that are responsible for fetching data from Neo4j. This schema will define the types and GraphQL queries that we'll be able to use in our API. You can think of the schema as the API blueprint. Each GraphQL field is resolved by a resolver function. The resolver function defines how data is fetched for that field. let query = "MATCH (movie:Movie) WHERE movie.title CONTAINS $subString RETURN movie LIMIT $limit;"
Now that we've defined the GraphQL schema and resolver functions we are ready to serve the GraphQL endpoint, using Express.js. /graphql - this will be our GraphQL API endpoint, handled by an executable schema (yet to be created) that we're passing to the graphqlExpress route handler. schema.js - Here we define our GraphQL schema using the GraphQL Schema Definition Language as a template string. resolvers.js - Here we declare our resolver functions. Resolver functions define how to fetch data for each GraphQL field, in this case from a Neo4j database. We use the Cypher query language to query Neo4j for movies and recommendations. server.js - Finally, we define our routes for our GraphQL endpoint (as well as the Graphiql IDE) and use the graphql-server-express helper to create a Express.js server for our GraphQL API. GraphQL is still new to almost everyone with the exception of Facebook, where it has been used since 2012, so many conventions and best practices are still being developed. However, GraphQL First Development is a philosophy the community has adopted which gives structure to the process of building a GraphQL API. By defining a contract for the API, expressed as a GraphQL schema, the frontend and backend developer teams can independently implement their applications, using the schema as a guide. 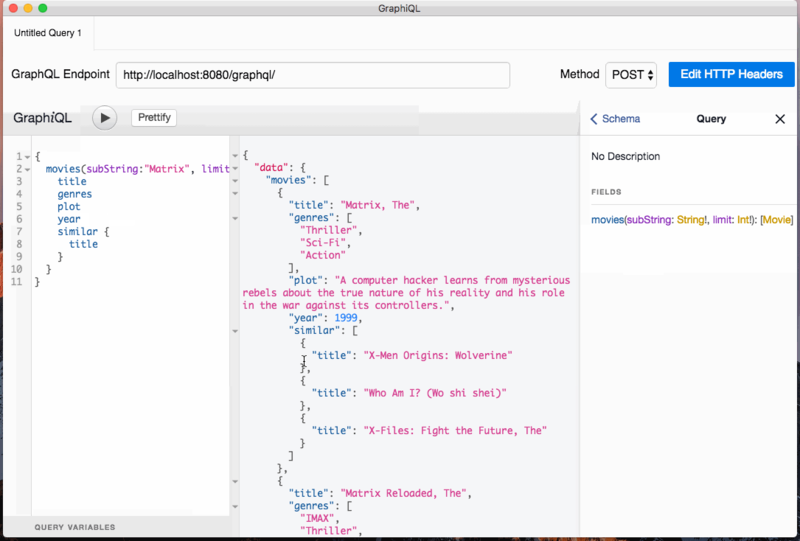 To make GraphQL First Development even easier with Neo4j, the Neo4j team has built neo4j-graphql-cli, a command line tool for easily spinning up a Neo4j backed GraphQL endpoint based on a user defined GraphQL schema that can optionally be annotated with Cypher queries - exposing the power of Cypher from within GraphQL. You can learn more about this here. Article image: Louvre (source: jraffin).